For the last twenty-five years, there has been an upsurge in the construction of new sacred spaces which take into consideration things like astronomy, geometry and earth energies. The earliest new sacred space that I know of was built by Chuck Pettis at the Foundation of Light in Ithaca, New York in the mid-seventies. In the early eighties, Sig was introduced to Grandmother Twylah Nitsch, Wolf Clan Mother of the Seneca. A wise woman, Grandmother Twylah was more interested in the colour of your heart than the colour of your skin. At that time, she ran her Seneca Historical Society at her home on the Cattaraugus Indian Reservation in western New York. When I met her, she was constructing various kinds of sacred spaces including the two below. To my surprise, while she did not use dowsing at that time, the Earth energies at these wheels conformed perfectly to the patterns I had been finding in Great Britain and in New England at much older sacred spaces. This Medicine Wheel was under construction when I arrived at Grandmother Twylah's home. I dowsed it, and it conformed exactly to the Earth Energy patterns I had found at older sacred sites. This white pine wheel was constructed later at Grandmother Twylah's home. There is a dome of water in the middle of the circle, and five veins exit - one out of the mouth (to the South), and the other four exit under four of the white pines! Seneca Indian Howard Isaac stands in front of a Medicine Wheel at Grandmother Twylah's home. Notice the clear delineation of the Four Directions. For four years in the early Nineties, Sig taught an apprenticeship program in the Construction and Uses of Sacred Space in Vermont, USA. The final project of this school was the construction of some new sacred spaces. Many different ones were built and here are just a few of them. Lynn's Circle Dancing Circle. There is a beautiful square stone-lined fire-pit in the center. Central Vermont. This large stone ring has orientations to Solstice and Equinox Sunrises and Sunsets, and is located in Northeastern Connecticut. The ability to orient various stones astronomically was learned in the school, and today, new builders can use the Sunfinder on this website to do the same. There many other new sacred spaces constructed elsewhere too. More and more people around the world are building new sacred spaces using principles like those discussed throughout the Mid-Atlantic Geomancy website. Here are a few examples from the other side of The Big Pond. The Swedes have been celebrating Midsommar (June 24th) at least since Viking times. There are more labyrinths along the coast of Sweden than anywhere else on Earth. I built this on with friends on an island in the Stockholm archipelago. however, several years ago, in the middle of the ring is a sculpture by modern artist Anish Kapoor. It is a wonderful mixture of the old and new that is too seldom seen at ancient sacred spaces. This beautiful small ring in Herefordshire was built several years ago by dowsers John and Jill Moss. This much more massive stone ring was recently built by quarrymen at Hamm Hill in the middle of their quarry in southern Somerset. Shaun Kirwin is a builder of sacred circles here in the UK. 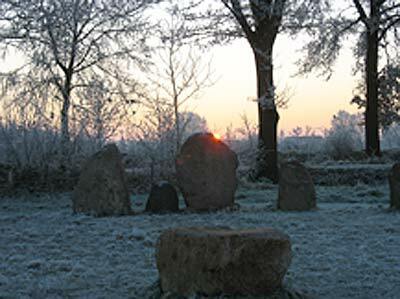 For Summer Solstice 2006, he built the temporary wooden Sunrise Circle near Frome in Somerset. I was most intrigued by the sacred geometry he used to lay out the circle. This is a really nice piece of work! An innovative sundial at the Struunpad in Koekangerveld, Drenthe, The Netherlands. The metal sheet tells you where to stand on the appropriate month, and your shadow tells you what time it is!